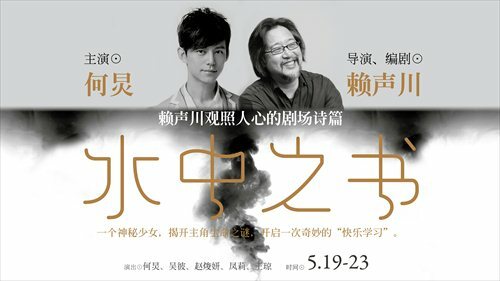 He Jiong, famed host of the wildly popular Happy Camp variety show, is set to take the lead in a new play by theater maestro Stan Lai titled Writing in Water. The show will be performed in Chinese with English subtitles in Shanghai from May 19 to 23. This is the second time that He, a former Arabic teacher, will perform in one of Lai's productions. A decade ago, He took a comic role in the famous Secret Love in Peach Blossom Land, starring alongside Xie Na, Huang Lei and Yuan Quan. The current production is adapted from a workshop piece titled Happiness Lessons, developed by Lai and the Hong Kong Repertory Theatre. Happiness Lessons takes inspiration from Lai's experiences translating the book Happiness: A Guide to Life's Most Important Skill, by French writer and Buddhist monk Matthieu Ricard. Writing in Water revolves around a man named He Shi, who studied in the UK and returns to China to teach lessons on happiness. However, He's partner keeps pushing him to make more money, which frustrates He because he cares more about teaching people how to feel happy rather than expanding their business. One day He, who never knew his parents, receives a message about inheriting a seaside house from his mother, and he embarks on a mysterious trip that changes his life. Lai told the Global Times that He Jiong was the first person that came to mind for the lead. "One reason is that this role is someone who often speaks to the public and who talks about philosophy and psychology. I think He Jiong has such an extrovert side. But the role also exhibits introspective thinking - how to deal with unhappiness hidden in his heart - and for that part, I think He Jiong can also bring it out through his performance," Lai said. "In Secret Love in Peach Blossom Land, He proved his comic capacity, and this time he will be surely qualified to deliver a serious role as well," added Lai. He Jiong said he didn't hesitate in accepting the role because he considers the play a valuable opportunity to understand himself more. "To be frank, I've been hosting TV programs for such a long time, and sometimes I find that I gradually become a character that's adapted to TV audiences' need," said He, whose on-screen persona was always happy, modest and considerate. "But the real me, or in other words, how I will respond in a different environment from TV, I'm also very interested to discover." Last year, GQ China noted that while the host and actor has become a key figure in China's entertainment industry, "middle-aged He Jiong also faces unprecedented confusion. He carefully hides the hardships and unhappiness from public attention, but in real life, midlife crisis and sadness will attack him abruptly." "I think Lai has a special charm; with him, you only want to be honest," He said. "This play is actually more about life and human feelings, and I'm looking forward to working with Lai and communicating with him openly and honestly. I think I'll learn something from the process." He told the Global Times that he feels that happiness is accessible through learning. "Why should a person learn to be happy? It's because sometimes you're not as frustrated as you think, but you magnify your pressure or even show off with it in front of your friends, which may lead more people to be unhappy like you. But I do feel that one's happiness can be decided by oneself. Maybe it's through reading, watching a play or encountering a person. I think the situation is different for each person," He said. Lai said the play offers many layers of stories, and the stage will be rendered into a poetic set with multimedia projections created by Sandra Woodall.